Exterior: 12' 6" x 5' 4"
Interior: 8' 6" x 2' 8"
Capacity: 6 Adults or 1600 lbs. the boat is a 2006 and was used about 34 hours same with engine. engine is a 2002 mercury 9.9 outboard. 3rd pull and that's it. 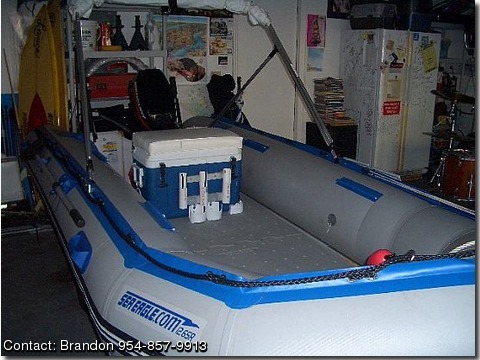 boat is cept in a garage nicely and neatly store, always clean.hull number id#les84014i606. come with every thing that you see on the images. and wakeboard,plastic floorboard,2 sets of oars, 2 gas tanks one that is care able and one that set on the back with engine, electric pump, canopy, foot pump caring bag,rain cover aluminum seat, with cooler that's a seat,dolly wheels stern light with battery , trailer, storage bags,life jackets its all here and 6 mouths Warranty, boats buyer guide, bill of sale, we are asking about $3650, reducet if any questions about the boat, engine or any of the accessories please call (954)857-9913 ask for brandon thank you!